I travel to customer sites and I cannot imagine driving without a GPS device or an application like Google Maps in a new city. Taking the right turns in cities like Boston seems like a daunting task without the friendly voice of GPS guidance. The burden of navigation is lifted and allows you time to think more about meeting the destination. Assist+ is such a navigation device for Oracle Agile PLM. A similar scenario happens when the default Agile PLM user interface forces users to go through a new unfamiliar process or create a part or document with a mass of unfamiliar attributes without any guidance on reason or rules behind the data. You cannot visually differentiate what is critically important as opposed to what is just informational. The attributes are usually not for everyone. On a business case document, the finance people fill out the price and volume forecasts, the engineer needs to fill out dimensions, sales people list out potential target customers, and operations may fill out the required contract manufacturers. Nothing on the screen guides you through this process except for the label on detail about the attributes. Users have to rely on rusty training. The same difficulty applies to table columns and redlining. One can limit attribute visibility though security or text codes in the attribute description or column name description, both inelegant solutions and prone to administrative management. The same problem exists for workflow statuses. The user has to rely on training on the actions to take on status. For example, a status “First Article Inspection” may require an assigned user to create an FAI record on the relationships tab. There is no help for the user on the steps to take except for the training that may have happened months ago. This situation is rife for errors, irrelevant or bad data. Rich text labels on attributes and workflow statuses are a solution to alleviate this pain point. Xavor calls this rich text enabling extension to Agile Assist+. Help messages appear when you hover over the attribute which can change based on the users role in Agile. Rich text mean graphics, video, charts, links to download and other supplementary documents. You are not limited to text but you can include images to help determine a value for an attribute. 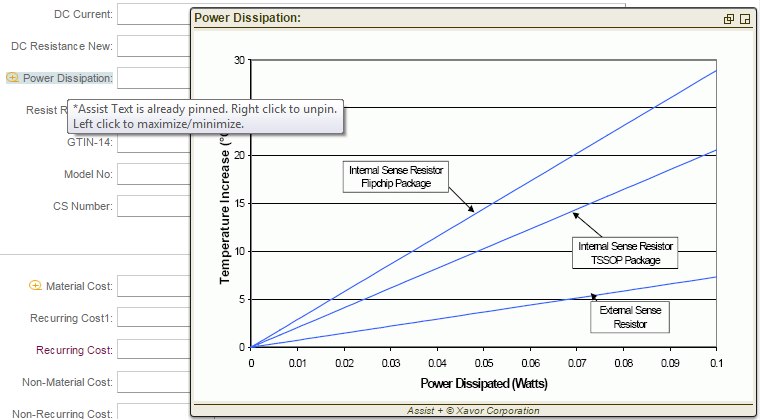 In this example, a displayed graph is used to determine the correct value for power dissipation to be entered. Below is an example of a description table specifying the meaning behind the code for Induction Tolerance. Rich text also appears on workflow statuses in order to prompt the approvers and assignees on action to take. With Xavor’s Assist+ solution, an Agile PLM user does not have to rely solely on training on the actions to take on statuses and attributes. The chance for bad actions, irrelevant data, error prone data or calls to the Agile admin help desk are reduced. The change analyst is freed from following-up on ill formed changes and focus more on enforcing change policy. Well created guidance content can be a GPS like navigation to create good parts and documents and reduce the cycle time of change management. With an extensive background in computer science and engineering management, Arif Ansari serves as a Managing Consultant in the Agile PLM Practice at Xavor. Since 2007, Arif has specialized in the implementation process for semiconductor and medical device firms for medium to large enterprise companies.